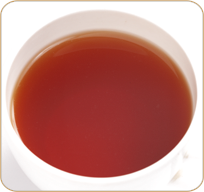 TEA BENEFIT Tea has a 5,000 year track record as a medicinal herb. In traditional Chinese medicine, tea is used to treat everything from inflammation and fatigue to bladder infection and cancer. It has long been considered a cleansing agent and a mild natural antidepressant. We know that tea supplies about the biggest payload of antioxidants - gram for gram - of just about any food or drink out there. Many of the alkaloids and chemical compounds in tea have proven medicinal uses. DESCRIPTION Famed the world over and flavored with the �Oil of Bergamot�. When you need to de-stress in the middle of the day without falling asleep, a cup of Earl Grey can be the perfect choice. The caffeine in Earl Grey is minimal, so it won't create the heart-racing effect of coffee or espresso but will provide clarity and focus instead.